As an investor you now have a plethora of investment options available, ranging from mutual funds, equities to fixed income securities like bank fixed deposits, bonds etc., Each and every investment you make has to go through three different stages i.e., i) Investment / Contribution stage, ii) Income Earning Stage & iii)Withdrawal or redemption stage. Generally most of the investors tend to make investments based on the tax treatment or the tax benefits available at the investment stage only. However, we need to be aware of the taxation rules applicable in all the three stages. For example: Let’s say you would like to book a 5 year Tax saving Bank Fixed Deposit. The investment in FD is eligible for tax deduction under section 80c. This is in the investment phase. Your capital earns ‘interest income’ for the next 5 years. This is taxable. When you redeem the FD on maturity, the withdrawal is tax-free given that tax is paid at the ‘growth or income earning stage’ itself. If you are aware of the tax implications at various investment stages, you can pick tax-efficient investment options. Tax efficiency is a measure of how much of an investment’s return is left over after taxes are paid. Tax efficiency is essential in order to maximize net returns on our investments. You need to consider the net tax adjusted returns and not just gross returns from your investments. However, the tax benefits should not be the main criteria for short-listing an investment option. They should be incidental and not the core. For example : You need to buy a Term insurance plan if you need adequate life cover, not because you get Tax exemption under section 80C. Let’s now pick various investment options and arrange them as per the above taxation regimes. NPS becomes an EEE investment w.e.f 1st April, 2019 (Latest Update : Dec 2018). EET : The tax treatment under this model is, you can claim tax deduction at the time of investment and the earnings is tax-free, but withdrawals at the time of maturity are taxed. So,under EET, the taxation is deferred till the time of withdrawal. Most of the pension plans fall under this category. ETE : Under this arrangement, tax benefits are available at the time of investment but earnings are taxed. The withdrawal at the time of maturity is tax-exempt given that taxes are paid at the growth/earnings stage itself. TEE : At the time of investment no tax benefits are available and you invest your tax adjusted income. However the earnings and withdrawal can be tax-free. TET : Under this model, earnings during the growth stage are tax exempted. TTE : This is possibly the lest tax-efficient model of all. There is no tax deduction offered at the time of investment and earnings are fully taxable. With income taxed every year, there are no tax implications at maturity. Unfortunately, a major portion of Indian Households’ savings are invested in the financial products which fall under this category. These investment options are not only less tax-efficient but can also erode your wealth if invested for long-term. You should invest in financial products based on your financial goals. If an investment option meets your requirements and is also a tax efficient one then it is well and good. Your investment strategy is to max out your after-tax returns. Thanks for this brilliant explanation. I have a little confusion. It is regarding ELSS mutual funds. You have kept it in EEE category in the image, but when you are explaining the different categories later then ELSS is mentioned under EET category. Could you please clear this? Also, when ELSS is taxed, only the returns are taxed or the full amount (principal + return)? From FY 2018-19 onwards, the long-term capital gains (above Rs 1 Lakh) on Equity funds is subject to Taxes. ELSS funds under -> EET category. Hence, the explanation in the post. But, yes, I need to update the image. Will do it shortly, thank you! But the important part of the question isn’t answered yet. Lets say I invested Rs.100 in Jan-2019 in ELSS fund. I earned Rs.40 on it till Jan-2022. When I am withdrawing Rs.140 in Feb-2022, then will I have to pay tax on Rs.100 or Rs. 40 or Rs.140 ? The tax (if any) is applicable on capital gains (returns) only ie Rs 40 in the above example and not on total proceeds ie Rs 140. The link to Capital Gain Tax was really helpful. I retired on attaining the age of 60 years on 31st august 2018 what tax exemption on medical treatment ,I can get for for medical treatment of self (sr.Citizen) ,spouse, children who are major one. How much I can get maximum rebate/exemption u/s 80d ,my department deducted one month salary + da ,in 36 installments +balance from last pay or earned leave encasement or any other payments under medical health scheme for post retirement medical from selected hospitals for self spouse & dependents . All amount deducted during assessment year 2018-19 will be deducted under what act of income tax. Assuming you are referring to FY 2018-19, suggest you to kindly go through this article @ Health Insurance Tax Benefits (under Section 80D) for FY 2018-19 / AY 2019-20. Query : If I take Term insurance on my parents name :- Mom is 57years old and Dad is 63years old. This commodity – Term insurance comes under 80C or 80D ? FIRST OF ALL ARE THEY ELIGIBLE TO TAKE TERM INSURANCE ? My taxable amount is above 10L;-)…Can’t incur more taxes ! Kindly let me know ? Dear Satish ..Firstly, kindly understand if they really need life cover now? Do they have dependents and/or financial liabilities? Sir,my question is”I have invested 60000 on NSC and after 5 year it’s maturity amount will be 88000.according to you the interest decided on yearly basis and add to my income every fy and deduct accordingly. 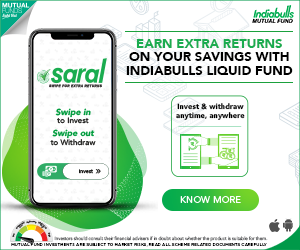 As this Interest is re-invested in National Savings Certificate which is a specified instrument u/s 80C, a taxpayer can claim this amount of interest as a tax deduction under Section 80C. So, the taxpayer will first have to show this interest earned as an income and then claim this as a deduction under Section 80C. You are correct. The maturity proceeds from ULIPs are tax-free. I had used the same & correct info-graphic in other posts like ‘Different Assets have different Tax implications‘ but failed to update this post. Beautiful written very informative article. Will u please explain the tax deductions in case of NSCs and RDs and PO monthly income schemes with the help of examples. Dear Priyangshu ..The interest income from these options is taxable. Will try to publish a separate article on this. Read: RDs/FDs & tax implications. Is EPF+VPF still a EEE product? I am hearing a lot of rumors about it. Please clarify. Dear Sandeep ..As of now it is under EEE category only. However, I am currently saving 3500 in my VPF and want to route it towards ELSS. What’s your say on this. My goal is to build wealth along with tax saving. For long term goal + tax saving purposes then ELSS can be a good choice. 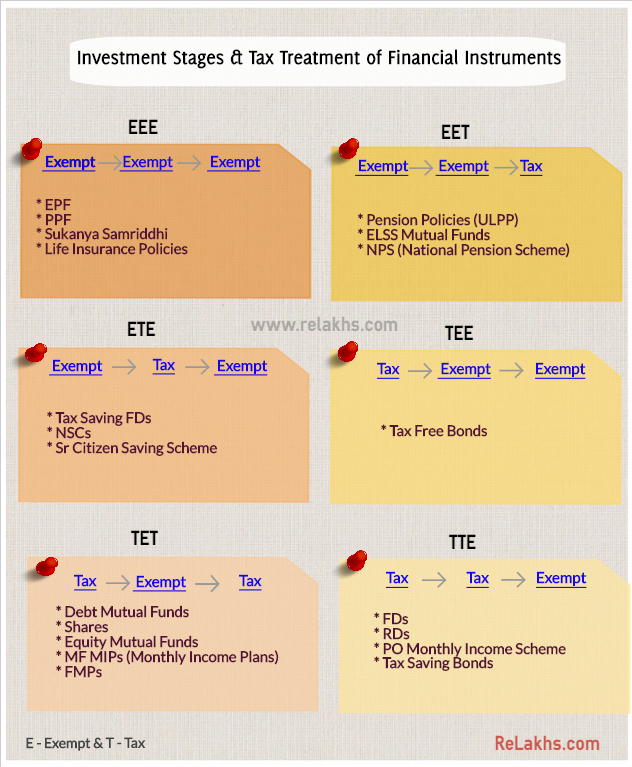 Best ELSS Tax saving mutual funds. How to pick right mutual fund scheme based on risk ratios? Thanks Sreekanth for all your help. your blog is quite educative. 1.Please quote an example each for EEE,EET,ETE,TEE.TET,TTE with its tax u/s and tax computation, including short/long term capital gains. 2.Also elucidate the difference in Tax Free Bond ( under TEE) and Tax Saving Bond (under TTE), with an example alonwith its short/ long term capital gains. 3. kindly provide your mail id and contact no for better communication. Dear Dhillon ..Will try to post one more article with the said suggestions. Thank you dear Parimal..Keep visiting! Do share the article(s) with your friends. Thanks for maintaining a great website. I will be getting maturity proceeds from LIC ( policy over 20 years ) , and will also be redeeming units of equity mutual funds. Since all these are exempted from tax, should I report them at all ? If yes, should it be under the head ‘Income claimed exempt from tax ‘ ? You can report them under ‘Schedule EI’ (Exempt income) of an ITR. Dear Deepak..May I know about which investment product are you referring to?? I am asking about equity linked non elss funds. And elss too(after three years of saving). Kindly note that ‘,o Long Term capital gain taxes are levied on all equity oriented funds’ (ELSS/non ELSS funds). Read: Mutual Fund Taxation Rules.. If a person (Age 59 yrs) don’t have any source of income except the interest earned on FDs (approx 1.2Lakhs/annum). Please confirm if he has to fill income tax and pay taxes ? Dear Bhupendra..Not mandatory. Has the TDS been deducted on FDs? If so either he/she can submit Form 15G or if TDS is already been deducted, can claim refund by filing ITR. Thanks for update Sreekanth, TDS not deducted Just wanted to know if he has to pay tax in each FY. Dear Bhupendra..If the total income earned is below the basic exemption limit then not required. Sir, my question is about Equity Mutual Funds. If I purchase an Equity MF in Feb 2016 for 10k, and after one year if I sell it for say 10.1k and get 10.1k in SB a/c. So for next FY 2016-17, when I file ITR what should I write in STCG and LTCG fields? The LTCG on Equity mutual funds is tax-exempted. You can show this LTCG as ‘Exempt income’ in your ITR. Read : MF taxation rules..
Sir if I buy an Equity MF in 10k and sell it at 10.1k after one year only 100/- will be considered as income right? Which I need to show in Exempt Income. I’ve another question. Which is best way for FDs? I don’t file 15H and let tax deduce. At year-end I file ITR and get returns. Or should I put 15G from next FY and at year end and sum all incomes and pay taxes manually? Which option will you suggest? If 2nd option, how will I pay tax manually after calculation? As you are referring to both Form 15H & 15G., may I know your age?? Also, it depends on your other sources of income. Sir i have a doubt..You generally insists on Term insurance..I feel that the traditional insurance products gives an insurance coverage even during the policy period and still if the investor is alive,he gets extra amount in form of Bonus+FAB which comes closer to 6-7% which is an excellent option for long term (>15 years) right whereas Term insurance is only till certain time or else the entire amount gets wasted..Need your advice pls.. Term insurance is the basic form of life insurance cover. An earning member of the family has to buy an adequate life cover so that in any unfortunate event, his/her family members can continue same standard of living and also can meet future long term goals (if any). Term insurance plan provides risk cover during the policy period. If 6 to 7% makes traditional plans an excellent option to you, don’t you think investing in Provident Fund is more beneficial and a better option?? Term insurance Vs traditional plans. which is available at affordable premiums through Term plans. Hmm i got it sir..
1. Please write an article about Financial planner job,Mutual fund agents and Insurance agents and their Pay and commission structure..
2. Also i have a question whether its better to insure with Private Insurance companies who gets lesser premium and lesser claim settlement ration(range of 90%) so that some money is saved which can be used for Investments..
3. Equity Mutual funds are been given good return for a longer term in India since we had a long term bullish market..Countries like Japan and some other had longer term bearish market for 40 – 65 years..So how to take decision keeping in mind that this Long term bull market will continue?? 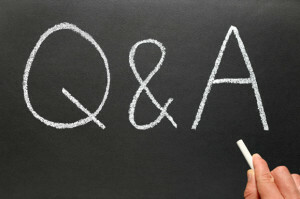 Looking forward for reply of all 3 questions above..Thanks in advance..
1 – By any chance are you an Advisor? Will surely try to write on the suggested topic. 2 – Some of the pvt life insurance companies do have very good claim settlement track record and they offer term plans at very competitive premium rates. Kindly read: Latest Claim Settlement Ratio of Life insurance companies. One can buy a Term plan depending on the affordability and his requirements from any life insurance company. 3 – Situation like Japan can not be ruled out in equity markets. No one can predict the future. But do note that ‘not taking sufficient RISK itself is the biggest risk of all’. One needs to invest in all possible asset classes based on his/her financial goals. Our markets too had ‘bear phases’ in the last two decades, but still they could generate decent returns right?? Kindly share your views.